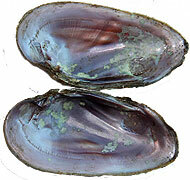 41 freshwater mussel species live in Ontario rivers and lakes. Freshwater mussels are an important part of aquatic ecosystems as they filter the water and are a food source for other animals. Travelling only as far as about 1 meter in their entire lives (which can be up to 100 years! 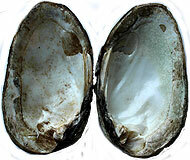 ), freshwater mussels are very vulnerable to changes in their habitat such as pollution, changing water levels and temperature and invasive species. 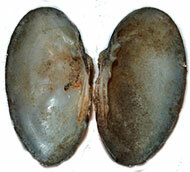 Freshwater mussels are therefore considered indicators of ecosystem health because of their sedentary lives. 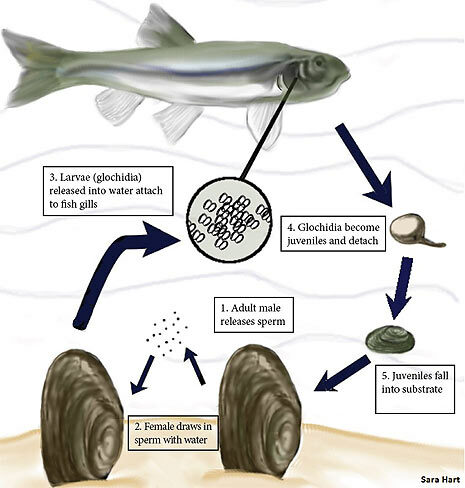 Mussels use fish to move their larvae ("glochidia") downstream. Like a parasite, glochidia attach to and feed off of the gills of host-fish as they grow and transform into juvenile mussels. These juveniles then drop off the fish and begin their lives as filter feeders. They feed on algae and other particles from the surrounding water. Some freshwater mussel species have adapted their tissues to look like small fish or insects, known as "lures", which attract larger fish. Other species release their glochidia into the water and they passively attach to fish swimming nearby. Finally, two species actually catch host-fish by closing their shell on the fish and releasing glochidia onto the gills. The fish is then released and swims away. Unfortunately, over 65% of freshwater mussel species are endangered in Ontario as a result of habitat loss, pollution, competition from invasive zebra and quagga mussels and loss of host-fish species. 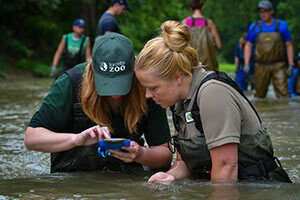 The Toronto Zoo is conducting research into freshwater mussel populations in the inland watersheds of Lake Ontario so that we can learn how to better protect these elusive animals, and you can help! Public awareness and information about abundances and locations of freshwater mussels is crucial to prevent further population losses of these important species. Do you think you may have spotted a freshwater mussel at the cottage or on a riverside walk? 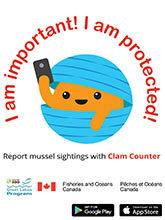 If so, report your sighting using the Clam Counter freshwater mussel identification and reporting app, available in English and French for iOS and Android devices. Information gathered through Clam Counter is shared with partner organizations such as Fisheries and Oceans Canada to determine the status of freshwater mussel populations and to supplement conservation programs and initiatives. With your help, we can provide a safer and cleaner environment for these fascinating creatures!